STILL, it looks very nice, and within a few days they’re almost at their goal. It seems they WILL reach their goal, and it’s just a matter of how much over it they will go. I see capital ships with turn-based combat, away teams involved in turn based combat, base building, and characterisation. So… Star Trek-style space battles, Star Trek-style ground combat, Deep Space Nine (that is… Star Trek-style) space station control, and sci-fi crew members … kinda like Star Trek, but we could also throw Firefly or something like that in there as a comparison too. I just finished a fairly epic Sunday evening of board games. We played fair bit of Dominion, Resistance: Avalon, and the my new Space Alert expansion: The New Frontier. Also, one of the new additions to the group brought along Cards Against Humanity which I think deserves its own post. 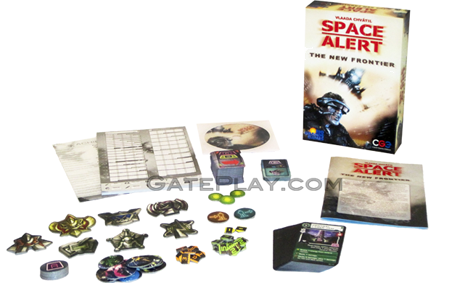 You may remember I referred to Space Alert as the greatest co-op game ever, because it avoids Game By Committee. This was the first time we’d cracked out the Space Alert expansion. I’ve been sitting on it for a while, and one of the reasons for that is that a lot of the expansion seems to include ways of making the game harder. This is pretty common for co-op games. I find it is also pretty common for us to not require any further difficulty! We were only succeeding at about 50% of our games anyway. If we played a couple sessions back-to-back we might get smooth enough to mix in a couple “yellow-difficulty” cards, but a whole new “red” difficulty? Are you crazy? 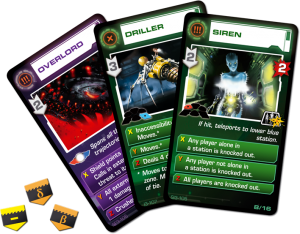 The expansion also includes an entire new deck of action cards. So-called “double-action” cards they allow for, theoretically, twice as many actions but the way they are designed it would be quite challenging to use them efficiently. To compensate for (theoretically!) twice as many actions the expansion includes a slew of harder mission tracks. Red difficulty. Harder sound tracks. I’m really not convinced we’ll ever use them. So there’s a couple things added to the expansion I’m sure say, a dorm-full of college students, will use but not really our group. Fortunately for us, though, there is some quite fun additions that both the uni-bums and hard-working-average Joe can utilise. Previously there was a mission log which you could scribble in if you wanted to. We did – mostly to track our best score. We’d also go to the effort of writing down the crew. If we got the same crew together, we’d try and dig up their log and add to it. If we got the same crew together. That never happened as far as I know. The expansion fixes this all quite nicely. Now everyone gets a character sheet, and they can track their individual missions on that sheet. But it’s more than just a score-card, with the expansion this is a whole new experience system including a class-like specialisations. So you and your crew successfully complete a mission (yay!) Then you add up the points, convert that to experience, and voilà, after a success or two you level up. When you level up you get to pick the first rank of a specialisation. There are 10 specialisations to choose from each with three ranks (novice, advanced, expert.) So you can, eventually, get several expert specialisations under your belt. This system replaced the heroic action cards which were, by comparison, pretty bland. 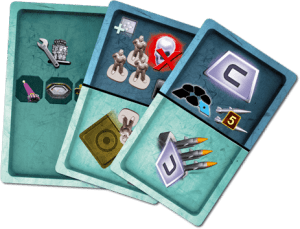 You pick one of the specialisations you have ranks in at the start of the game and take a card corresponding with that specialisation (for example, the data analyst gets a card that lets them use the main computer from any room on the ship.) As mentioned, this card replaces the heroic action card from the base. Before you get any ranks, you’re unarguably going to be weaker than with the base game. However with a rank in a specialisation you should be about the same strength, and when you get to advanced and expert levels (with which you can choose better cards) you become more effective. Over the Christmas break I’ll be camping out with a couple friends. I expect to give this expansion a thorough workout. No Man’s Sky > Star Citizen? No Man’s Sky was just announced at the VGX with a pretty spectacular trailer. From what I see here it looks to me to be more in line with what interests me than Star Citizen. There’s not much in the way of details, but many important things stand out. First we see our view jumping into a ship that is reminiscent of an X-Wing. Next we are flying up from the surface of a planet. A planet that looks stunning, but is apparently procedurally generated. I’m not likely to search out every nook and cranny of a planet, but being able to buzz around one that looks amazing “just for fun” really holds a lot of appeal. I’m getting a lot of this jive from Kerbal Space Program – but imagine it with practically infinite planets. The quick cuts show us all the classic sci-fi planets: Jungles and Deserts (complete with giant sand worms) among them. As the ship’s nose points up, they head into OUUUTTTEEEERRR SPAAAAAAAACE! From here we see other single-man ships buzzing around, breaking the atmosphere and joining into what looks like some sort of fleet. Most notably a large capital ship that at least invokes a Star Destroyer-esk feeling of power and size. Other flashes of gameplay show deep-space operations through asteroid fields and the like. The great thing this game invokes is a real feeling of all our favourite sci-fi shows. Landing on a planet surface, then flying out to meet a Star Destroyer was always the one thing X-Wing vs TIE Fighter was missing. So No Man’s Sky looks ambitious, yes, but not wildly so. It looks like it captures the feel of classic sci-fi without getting bogged down. Something I’m very afraid Star Citizen will succumb to, with its focus on trade, economy, vast universes and customisable ships. Star Citizen sounds kind of… boring. Except with space ships. A highly detailed, boring, space ship game. Just give me a number of very cool fighters to fly around in, and reasons to visit lots of cool places and blow things up.